Last night my mom, Chantelle, my Grammie, my aunt Jill, and I had a girl's night out to celebrate our July and August birthdays. 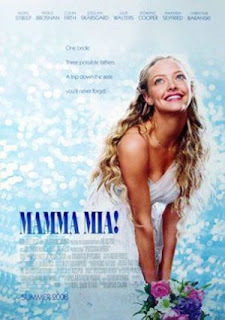 We went and saw Mamma Mia. I have always wanted to see the play, but never have. I loved the movie though! It was way cute. I loved all the Abba songs :) It makes ya want to go dance! Chantelle and I said we wished we could have been in the movie because it looks like it was sooo much fun to make. I have never been a super big fan of musicals, but I definitely recommend this one. Hopefully I am going to see it again tonight with Kevin's parents. Kevin is not excited to see it AT ALL. He's just not into musicals at all... Haha. Oh well, hopefully he wont think it's too stupid. So good to see you on Saturday! Love you! man i am totally curious about this movie. it's good to know you liked it.